"Piracy off the Horn of Africa itself was at its lowest having fallen by more than 90% from its peak in 2011," the bureau said. But an increase in piracy off west Africa, particularly from Nigeria, is a source of concern, the London-based bureau said in its annual global piracy report. "There were 264 attacks worldwide last year, the second year the figure has dropped," it said. Only 15 incidents off Somalia were reported in 2013, down from a peak of 237 in 2011 and the lowest since 2006 when there were 10 Somali attacks, it said. "The single biggest reason for the drop in worldwide piracy is the decrease in Somali piracy off the coast of East Africa," said the bureau's director, Pottengal Mukundan. "Increased international naval patrols, greater stability in Somalia, the use of private security teams and the improvement of vessel security had all contributed to the fall in piracy," said Mukundan. "It is imperative to continue combined international efforts to tackle Somali piracy. Any complacency at this stage could re-kindle pirate activity," Mukundan added. The report said more than 300 people were taken hostage at sea last year and 21 were injured, nearly all with guns or knives. 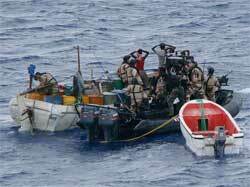 Pirates hijacked 12 vessels, boarded 202 and fired on 22 while 28 other ships reported attempted attacks, it said. Nigerian pirates were "particularly violent" and were responsible for the deaths of one person and the kidnapping of 36 to hold onshore for ransom. The report said that West African piracy made up 19% of attacks worldwide last year with Nigerian pirates accounting for 31 of the region's 51 attacks, the most since 2008.